This photo was taken at Jim Robertson and Bertha Walker's wedding day at Stoneyburn in 1961. 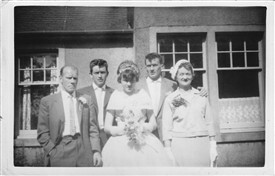 The photo shows "Juicy" (James Kane) and family: wife Mary, sons Pat and Billy, and daughter Rachael. Bertha was Mary's youngest sister. Love this site, love this photo Billy!